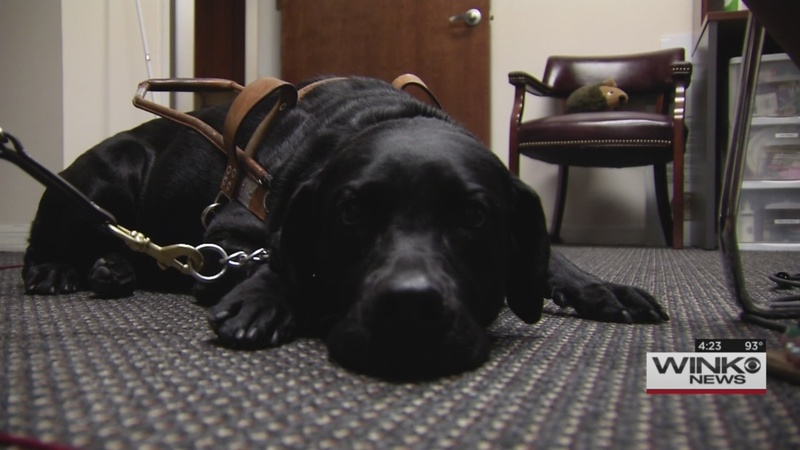 FORT MYERS, Fla.- A new law could put someone in jail for using a fake service dog. WINK News sat down with ADA advocate Michael Pierce who is legally blind. He uses a service dog, named Addy, to travel. Pierce says he, and other ADA advocates, have been fighting for this bill for a long time. “Think about the people who really need the dogs,” said Pierce. If caught, someone could face up to 60 days in jail, along with a $500 fine. To figure out if the dog is real or fake, business owners can only ask two questions. “Probably the way this would come up is if the animal were to destroy property, attack someone or to be some type of incident, and it would be investigated,” said Quick. Pierce says he knows the law will deter liars, and has advice on how to spot a fake. “If it’s very calm, and docile, and follows the commands it’s given, then it’s a trained service dog. If it’s barking, jumping around, then it’s probably not trained,” said Pierce. The law was signed by Governor Rick Scott on June 11 and will go into effect on July 1. It will also make it a second degree misdemeanor for business owners to prevent a disabled person from bringing a service dog inside. Pierce says, if you have any concerns, call the local ADA office at 239- 260-4575.